Whisky is one of the world’s most popular spirits, and comes in many different classes and types. The character and flavour of these differing types vary widely; this, of course, comes down to their varying chemical composition. Here, we take a look at where some of these different compounds come from, and what they contribute. Making whisky is, to an extent, a relatively simple process (albeit a long one). It starts with barley, which is soaked in water and then dried. The manner in which this drying is accomplished can affect the chemical composition of the finished whisky, and in the case of Scottish whiskies, was traditionally carried out using peat fires. The barley is then milled, then added to water. Mashing breaks down the starch in the barley into sugars, producing a sugary liquid called wort which can be used in the next stage of the process. This is where fermentation comes in. Yeast is added to the wort, which turns the sugars into alcohol; the exact yeast used can also have an effect on the final taste. After fermentation, the alcohol percentage of the wort is between 5-10%. Up to this point, the process has differed little from that which produces beers, but here is where it deviates. After fermentation, the liquid is referred to as the ‘wash’. It is transferred into a copper still – a piece of apparatus that functions exactly like a distillation apparatus in chemistry classrooms, albeit on a much larger scale. The alcohol desired from this process is that which comes out during the middle of the distillation process, known as the ‘heart’. The ‘foreshots’ which come out first are the compounds with the lowest boiling points, and include methanol, whilst the ‘feints’ which come out at the end of the distillation are mostly water. The ‘heart’, when removed, has an alcohol content of up to 70%. The final, most important step of whisky manufacture is ageing. The spirit is placed in oak barrels, and stored to mature for at least 3 years before it is then bottled and sold. This ageing process is also a primary source of chemical compounds in the finished product. Additionally, the environment in which the casks are stored can also have an influence on composition. So, now that we know a little more about how whisky is produced, it’s high time we discussed some of the compounds that give it its flavour. Phenols primarily contribute bitterness and smokiness to a whisky’s flavour. They’re particularly noticeable in whisky produced from barley that was dried using peat fires, as is still the case in a number of Scottish distilleries. The burning produces the phenolic compounds in the smoke, which are then absorbed by the barley. Charring of the barrels in which the whisky is later matured can also lead to the presence of phenolic compounds in the spirit. Phenol, cresols, xylenol and guaiacol are amongst the most important phenolic compounds in whisky, in terms of contribution to flavour. Guaiacol is also somewhat responsible for smokey flavours in coffee, and in smoked meats. Compounds called cresols are the culprits when it comes to the oft-mentioned similarity in aroma between Scotch whisky and band-aids. The particular compound responsible is meta-cresol, which has a medicinal aroma, and was also traditionally used in band-aids as an antiseptic. Eugenol is also present in many whiskies, a compound more commonly found in cloves, and partly responsible for their spicy aroma. A large number of compounds get into the whisky during the ageing process. Amongst these are two compounds that have actually taken on whisky’s name: the whisky lactones. These are, in fact, just isomers of each other, and chemically are named cis- and trans-3-methyl-4-octanolide. Both of these isomers originate from the oak barrels in which the whisky is aged, and both offer a coconut flavour. The cis isomer is the dominant of the two, and has a stronger, spicier flavour. Although not shown in the graphic, acetaldehyde is a feature in many whiskies, representing a large percentage of the total aldehyde content. It originates from the fermentation process, and though some is lost in the ‘foreshots’ during the distillation process, some remains, and adds a pungent, sharp note to the taste. Other aldehydes originate, as with the whisky lactones, from the oak barrels in which the whisky is matured. Syringaldehyde gives a spicy, smoky note, with furfural providing an almond-like, grainy flavour. More familiar is vanillin, the compound that also gives vanilla its aroma. 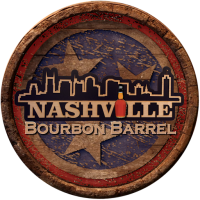 Bourbons are particularly noted for their vanillin content; new casks are used for the ageing of each batch of bourbon, as the vanillin content of the wood is much lower after one ageing cycle. Other aldehydes from the wood include coniferaldehyde and sinapaldehyde. Additionally, some simpler aldehydes such as hexanal can contribute a grassy note in some whiskies, whilst a malty flavour is associated with 2- and 3-methylbutanal. A large number of esters are produced during the fermentation process, resulting from the combination of alcohols and either fatty acids, or the acetates produced during fermentation. Many light esters with fruity flavours and aromas are formed, though these are removed in the ‘foreshots’ during the distillation process. These include isoamyl acetate, an ester with a banana-like aroma. The most abundant ester in the ‘heart’ is commonly ethyl hexanoate, which has an aroma described as apple-like. There are a whole range of other esters that can be formed (check out this handy guide to their aromas), and these can be influenced by fermentation conditions. Many whiskies undergo chill filtration to remove much of the ester concentration from the final product. The reasons for this are purely aesthetic, as their presence can contribute to the development of cloudiness in the final product. 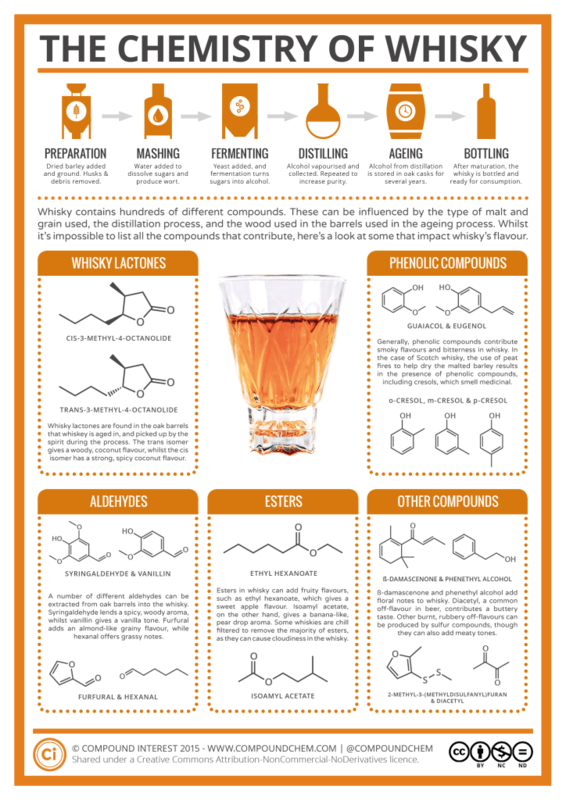 Other compounds in whiskey, outside of the aforementioned categories, can further contribute to its character. For example, two compounds commonly found in roses, beta-damascenone and phenylethyl alcohol, can also be found in some whiskies, and contribute a floral note. Diacetyl, a compound commonly associated with off-flavours in beers, is also found in whiskies, and has a buttery aroma. The presence of some compounds is less than desirable. Sulfur-containing compounds, from the simple hydrogen sulfide to the more complex sulfur-containing aromatic compounds, are the primary cause of off-flavours in whisky. Their presence is reduced by the use of copper stills, as the copper is capable of binding the sulfur compounds, and preventing them from making their way into the final spirit. Whilst we’ve mentioned a fair number of compounds here, really, we’ve barely scratched the surface as far as the assortment of compounds in whisky are concerned. Whilst it would be an impossibility to discuss them all, you can read a little more about some of them via the further reading links below. In the meantime, if you’re a whisky drinker, you’ll hopefully have a new-found appreciation for the chemical complexity of the spirit the next time you pour yourself a dram!